Laura Gibbs and I were both in the first SF/Fantasy course — experimented with and submitted fictional treatments for essays — not at all well received by readers, which I expected. TAs were conspicuous by their and a few trolls that should have been stepped on…one even bullying Rabin into accepting a late final essay. Thanks Vanessa – most likely they’ve improved things since the first time as the number of TAs on the go was quite impressive and some (probably ex-participants) were forum savvy in a way I hadn’t noticed in xMOOCs before. Not sure what your fictional treatments were! – I tried to follow the guidelines like a good boy but beyond grammar, spelling, clarity of expression etc grading a literary essay in a meaningful objective way remains a mystery to me – a bit pointless in fact. Oops — I’d been thinking about helpful suggestions — mostly formatting, The opening is effective and promising but could be clearer and still keep the experimental effect. Recent major life changes completely pushed it off my radar. I left NM after almost 16 years there and moved to Yuma, Colorado — sight unseen, with my daughter and her family. Her husband is retiring and grew up here. We arrived late Saturday — I was worn out and still in rest and recovery mode. I didn’t blog mine but saved them (but have yet to reach that layer of unpacking) Most were standard following the rules essays but I got a wild hair a couple of times — and followed it because I was not in it for the certificate anyway. Besides it was mostly material I had taught — not to mention assigning and marking essays for. Did you feel Alice should be in a SF/Fantasy course? I think it a surprise to find her adventures in SF/fantasy. Yes I think so Jaap. 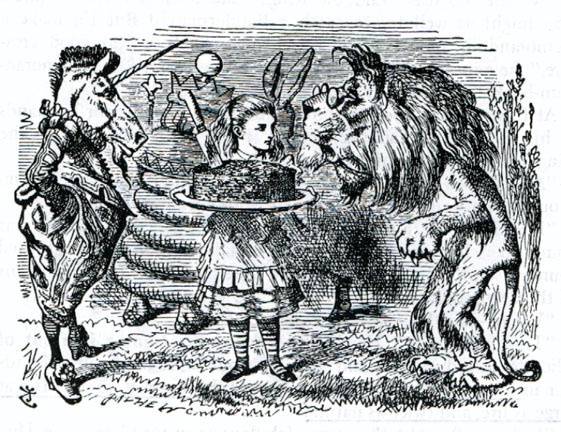 According to Wikipedia: “Fantasy is a genre of fiction that commonly uses magic and other supernatural phenomena as a primary plot element, theme, or setting” and I think Alice qualifies. Some other fiction covered on the course (not all by me! ): Grimm (Children’s and Household Tales), Stoker (Dracula), Shelley (Frankenstein), Hawthorne & Poe etc before getting on to what I think of as SF – Wells, Bradbury etc. Vanessa – thanks for the link to Laura’s 2012 blog. Spent some time reading it and wish I hadn’t overlooked it before writing the above. Amazing! – I’m in 101% agreement and wish I had the guts to get into the forums like she did but I suffer from a lack of confidence when it comes to educational practices in the humanities. Thanks also re helpful suggestions – pretty much in line with what I thought too. I’ll see the young lady in question quite shortly (now finished exams) and whether things are developing. Hope you are settling down well now in Yuma – moving home is said to be one of life’s greatest unsettling experiences so be sure to make the rest and recovery real (and virtual!) – take care!